Have you ever wondered why every cleaning product in the aisle smells of orange or lemon? The proven benefits and uses of orange essential oil place very highly in the control of household germs column. It might also remind you of a morning and waking up with a tall glass of orange juice, ready to start your day by staying healthy in a more natural way. Add a few drops orange and lemon oil to a mix of vinegar and distilled water. Pre-soak some rags with the solution to keep on hand for your own healthier version of bleach wipes. Be sure to store in a dark, glass container away from light to keep the orange oil from losing effectiveness. Diffusing a mix of orange, bergamot, and lemon during the height of cold and flu season may prevent you and your household from picking up any unwanted bugs that come through the door. Some people find that they develop skin issues in times of stress. (3) Using orange for its mood lifting properties may reduce the stress that triggers the overproduction of oil, allowing for a relaxed mind and clearer skin. Add a few drops of orange oil to almond oil for a temporary, pain-relieving massage. It may mix well with ginger or even turmeric for even more anti-inflammatory benefits. Using orange, lemon, and bergamot in your diffuser will not only kill the bacteria floating in the air but will also lift your mood and help you relax. Orange oil’s ability to help prevent cancer comes twofold: it shows antitumor activity and is an antioxidant that prevents cell damage from free radicals in the environment. Certain chemicals found in citrus oils like orange show effects of inhibiting the growth of some tumors. (6) Adding a few drops to your water may help keep you healthy beyond cleaning your home of bacteria. This is in conjunction with the benefit of improved mood and less stress, both of which can affect your health along with a diagnosis of cancer. As a mother, my house is generally ground zero for every sickness my kids encounter. This seems like it is a year-long battle against bacteria and viruses, one that seems particularly difficult during those long, cold winter months when we’re trapped inside together. I think that the citrus oils such as orange, lemon, and bergamot are the first ones I reach for when I’m planning on making any kind of cleaning product for my house. I keep pre-soaked rags in a jar on the counter. Using essential oils makes these rags safe enough for even my kids to use, rather than dry out their hands with commercially made bleach and alcohol wipes. I use orange and lemon along with vinegar and distilled water to make a cheap and easy cleaning solution. When making a spray for hard surfaces, I tend to use just a few drops of oil and distilled water. The best part of using orange oil for cleaning is the scent that is left behind. Not only do I get the satisfaction of having completely cleaned a room in my house, but I also benefit from orange’s mood-lifting scent, which reminds me of early morning breakfast, when it’s time to get up and get things done. This is a concentrate made particularly for mixing cleaning solutions for use around your house. Orange oil is good at tackling greasy areas in your kitchen with a lot of other chemicals. You can also use it to remove adhesive from stickers and labels, which is a bonus. The size of this container makes it more ideal than buying an oil that could be used in aromatherapy as well, giving you a home cleaning solution that is natural. It includes recommended measurements for adding to water, so there is no guessing as to how much is needed for each task. 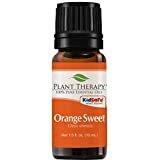 Plant Therapy Sweet Orange Essential Oil. 100% Pure, Undiluted, Therapeutic Grade. 10 ml (1/3 oz). Pressed from the peel as opposed to the juicy flesh of the orange fruit, this cold pressed oil is a high-grade choice when using orange oil around your home. As a therapeutic grade oil, this would be best to use if you plan on ingesting orange essential oil or are only going to use a few drops at a time in your diffuser. Since it is concentrated, you will only need a few drops in your aromatherapy diffuser, and you can enjoy the mood changing effects as well as disinfecting the air in your home. Orange oil may develop phototoxicity. Store in a dark container away from sunlight. Discard any oil if you think it has been too long in direct light. Always start with small doses and monitor for reactions. Use therapeutic grade oil, especially if ingesting, to prevent any reactions. Orange oil may have a sedative effect. Check with your doctor if you are taking medications which also have sedative side effects to prevent interactions. Children should not ingest large amounts of orange oil. This may cause colic and convulsions. Orange oil can be of great benefit to your health in many ways, from a clean house to a strengthened immune system. Please be sure to share this information with anyone who not only loves a clean house but is also ready to learn about the proven benefits and uses of orange essential oil in their overall health.